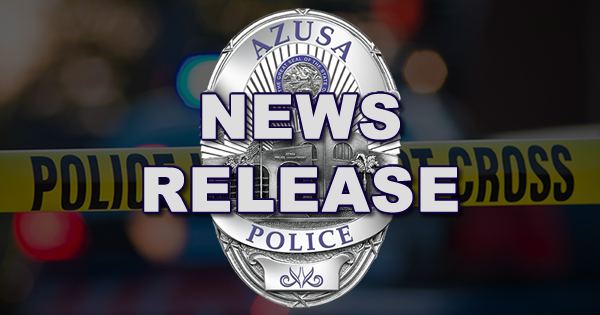 On January 28, 2019 at approximately 9:13 pm, the Azusa Police Department received a call of two suspicious subjects in the backyard of residence located in the 1300 blk. North Macneil Drive. Azusa Police Dispatch also received word from the reporting party that a "thumping noise" could be heard from the yard. Upon arrival at the scene, two adult African American male subjects fled from officers. A dark colored sport utility vehicle driven by suspect Zuberi Williams also fled the scene narrowly avoiding a traffic collision with a police vehicle. Officers initiated a pursuit of the vehicle. The pursuit ended when Williams collided with two parked vehicles in the area of San Gabriel Avenue and Ninth Street. Williams sustained non-life threatening injuries as a result of the traffic collision. He was treated at the scene by paramedics from the Los Angeles County Fire Department. Williams was placed under arrest by officers and an in-field booking was completed. Williams was booked for 459 PC- Burglary, 20001(a) VC - Hit and Run with Injury, and 2800.2 VC -Evading. Williams was subsequently transported and admitted to an area hospital for further treatment. Williams is currently on Post Release Community Supervision (PRCS). The two male subjects who fled the scene have not yet been located. The Azusa Police Department is seeking information regarding this crime. Anyone with information is encouraged to call Azusa Police Department Detective Bureau at (626) 812-3200.